Poor GMC Yukon. Couple a national credit-crunch with the rising cost of oil and an increasingly smug national environmental awareness and suddenly the Yukon, once beloved by many suburban drivers, has become an obnoxious symbol of overconsumption. Thus, GM has moved to repair the party-crasher image of the Yukon by developing a hybrid version that boosts city fuel economy by 50 percent. While the roughly $14k premium you pay for the hybrid is pretty steep, if you’re in the market for a full-size SUV that delivers mid-size crossover fuel economy, it’s hard to argue against giving the Yukon Hybrid a look, especially if you need the towing capacity. At 21-mpg city and 22-mpg highway fuel economy is a massive improvement over the standard model’s 14-mpg city and 19-mpg highway. 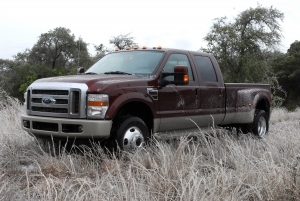 A towing capacity of 6,000 lbs makes this one of the most fuel-efficient haulers available. Eight passenger seating is a convenient capability, should you ever need it. This is a big car. So big, in fact, that it would be hard to justify the need for so much space, especially when equally efficient, slightly smaller competitors can be had for the same price. 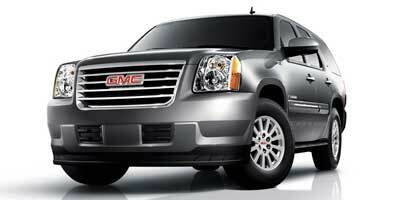 With a base MSRP of over $50k, this greener, more efficient Yukon doesn’t come cheap. The rear seats don’t fold flat and must be removed before the cargo space can be accessed. We’ve never driven an armored car, but we’d suspect the experience is similar to that of driving the Yukon, such is the sheer mass of the car. With an overall length of 202-inches and a curb weight of 5,270 lbs, the Yukon feels like a Sumo amongst children when driven in a big city. On the highway, the long wheelbase and soft suspension lend themselves to a smooth, comfortable drive. However, neither the 6.0-liter V-8 petrol engine nor the electric hybrid engine can hide the bulk of the car, though the gasoline engine driven by a slow-shifting four-speed transmission with its long ratios certainly deserves some of the blame. Being a hybrid, the Yukon is driven by both a 6.0-liter V-8 gasoline engine which produces 332 horsepower and 367 lb-ft of torque, as well as two 80 horsepower electric motors which reside within the transmission. Both rear-wheel and all-wheel drive models are available, and the power is driven through a combination of a four-speed automatic with the gasoline engine and a variable-ratio transmission with the electric motors. If it sounds confusing, it is. GM’s much-advertised OnStar system is included at no additional charge, and provides turn-by-turn audio navigation, vehicle diagnostics, remote unlock and hands-free calling. If you’re a visual person, digital screen navigation is also included as standard, as is an MP3 compatible CD player with voice recognition technology. There are only two options boxes to be ticked on the Yukon Hybrid, one being a Technology Package that adds a seatback or ceiling-mounted DVD entertainment system, the other being a power moonroof. The two-mode hybrid system is the core appeal of the Yukon Hybrid, and for good reason, Developed jointly by GM, BMW and Daimler Chrysler, the system is capable of using either the gasoline engine, electric motors or a combination of the two for propulsion, given the conditions. The efficiency doesn’t stop there though, as four of the engine’s cylinders can be shut down during light-load cruising (partial assistance is provided by one of the electric motors) and braking energy is used to charge the battery. While the hybrid system certainly goes a long way to boosting the city fuel economy of the LEV-II rated Yukon, mileage remains mediocre by industry standards. Two-wheel drive Yukon Hybrids return 21-mpg city and 22-mpg highway, while their four-wheel drive brethren return 20-mpg city and highway. Still, for a two-and-half-ton full-size SUV, that’s really impressive. It’s undeniably cavernous inside the Yukon thanks to its tall roofline. The elevation of the seats mean drivers enjoy a bird’s eye view of the road and legroom obviously isn’t an issue, even in the third-row. The interior is well appointed, as it should be at this price, though we question GM’s decision to use four separate buttons to cycle through drive data (most cars use one), and the ‘Economy’ gauge comes off as a bit gimmicky. Aside from its obvious size, the Yukon has an edgy, modern look about it from the rectangular headlights to the simple, clean-cut rear-end with its bumper-integrated towing hitch. The no less than half-dozen ‘Hybrid’ decals and emblems affixed to the exterior and seem a bit excessive, as if the car’s trying a bit too hard to shake the gas-guzzler stigma of the standard model. The two-mode hybrid system really adds to the price tag, and the Yukon Hybrid’s base MSRP of $50,945 puts it in competition with lower-priced competition such as the $40,450 Toyota Highlander Hybrid, $44,540 Dodge Durango Hybrid, $44,770 Chrysler Aspen Hybrid, all of which put the Yukon’s price in perspective. Even it’s cousin, the Chevrolet Tahoe Hybrid, comes in lower at $49,590. Its closest non-hybrid, high-mileage adversary is the Mercedes-Benz GL 320 CDI Diesel at $53,400. We can see the appeal of the Yukon Hybrid, especially with gas prices guaranteed to soar ever higher in the not so distant future. Right now, however, it’s a hard proposition to justify due to its $14k premium over the gas-powered model – a price difference that completely negates any potential gas savings. However, if you’ve got reservations about the size of your carbon footprint, absolutely need the space and towing capacity and money isn’t an issue, this is the car for you.